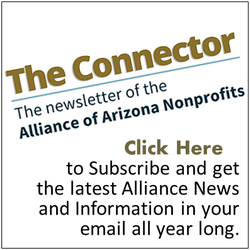 The Arizona Nonprofit Policy Council is an advisory group composed of individuals interested in public policy and advocacy for Arizona’s nonprofit sector. Alliance members are invited to join us for our next Nonprofit Policy Council meeting. The council is open to any member in good standing, but we do require advance registration. You can either join us in person or via conference call. Please register to receive call-in information.